Lately I’ve been looking for new healthy dessert recipes. I love something sweet, but I want to take care of my body at the same time. 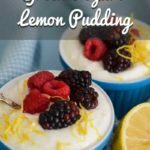 This Greek yogurt lemon pudding is a perfect everyday dessert that’s light and refreshing, with calcium, protein and nothing artificial. It takes literally 5 minutes to make, with only 3 ingredients. I got this recipe from a cooking class I attended on a recent trip to Greece with my husband and 18-year-old daughter. The cooking class was one of the highlights of our trip! If you are ever in Athens, I recommend that you check it out. The teacher, Fofi, was a gracious hostess with a wealth of knowledge about Greek food. We made zucchini balls with tzatziki, dolmathes (stuffed grape leaves), Greek salad, spanikopita (spinach pie), roasted lamb with potatoes, and this Greek yogurt lemon pudding. All this in 2 1/2 hours! At the end of the class, we got to eat the food at outdoor tables while listening to traditional Greek music. 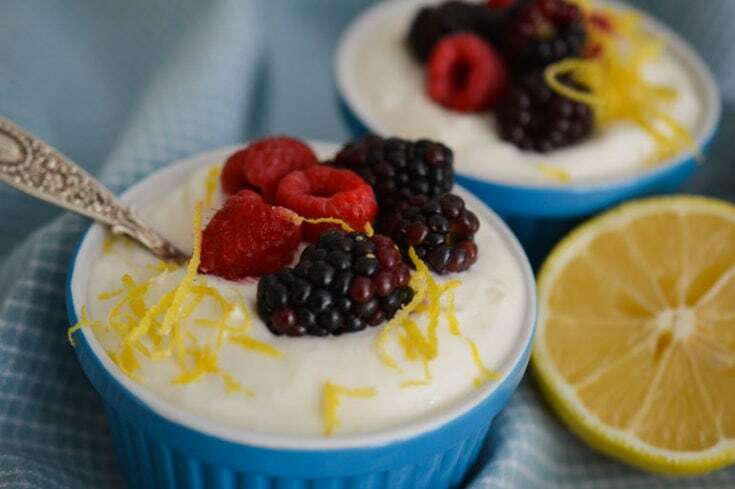 This Greek yogurt lemon pudding is ultra-easy and was perfect at the end of our big meal. I made it again soon after I got home, because I’ve become such a fan of Greek yogurt. 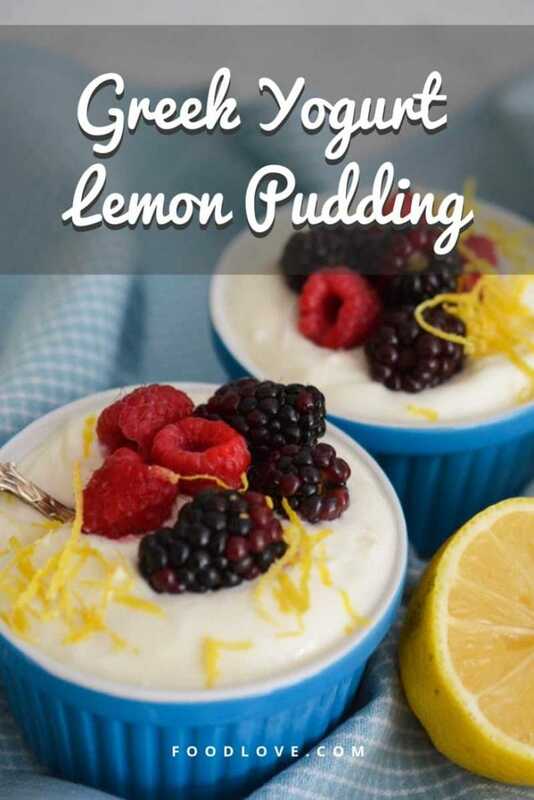 The ingredients for this recipe are simple: one large container of plain Greek yogurt, one can of sweetened condensed milk, and one lemon. 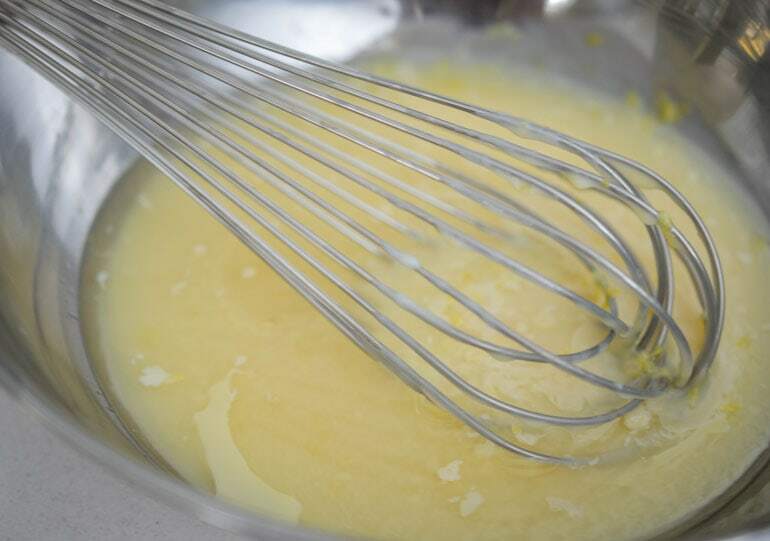 Using a whisk, combine the lemon juice and zest with the sweetened condensed milk in a large mixing bowl. Thoroughly mix the lemon juice and sweetened condensed milk before adding the yogurt. 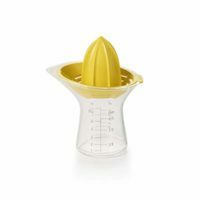 This way, the acid from the lemon will not cause the yogurt to separate and become watery. If you use the whole can of sweetened condensed milk, it makes a fairly sweet dessert. If you want it only lightly sweetened, use less. Next, blend in a large container (1 quart or 1 kilogram) of plain Greek yogurt. My favorite brand of Greek yogurt is Fage Total. When I talked to people in Greece, they seemed to like that brand as well. Fofi insisted that full fat yogurt is best, but it does contain a lot of fat. You can use full fat, lowfat or nonfat yogurt, but try to find one (like Fage Total), that does not have thickeners or other added ingredients. I settled on lowfat yogurt, which tastes rich but has fewer calories. Looking at the photo, maybe I should have used a bigger bowl! If you want, you can easily cut this recipe in half. You will have half a can of leftover sweetened condensed milk, but it will stay fresh for up to 2 weeks in the refrigerator or 3 months in the freezer. You can eat the pudding right away, but it will be thicker if you let it chill in the refrigerator for at least half an hour. This pudding tastes best topped with fresh fruit. Here I’ve used mixed berries, but kiwi, grapes or orange segments with the skin and pith removed would also be good choices. Use whatever seasonal fruit you like. Enjoy this recipe! It’s an indulgent sweet treat that you can feel good about serving yourself and your family. 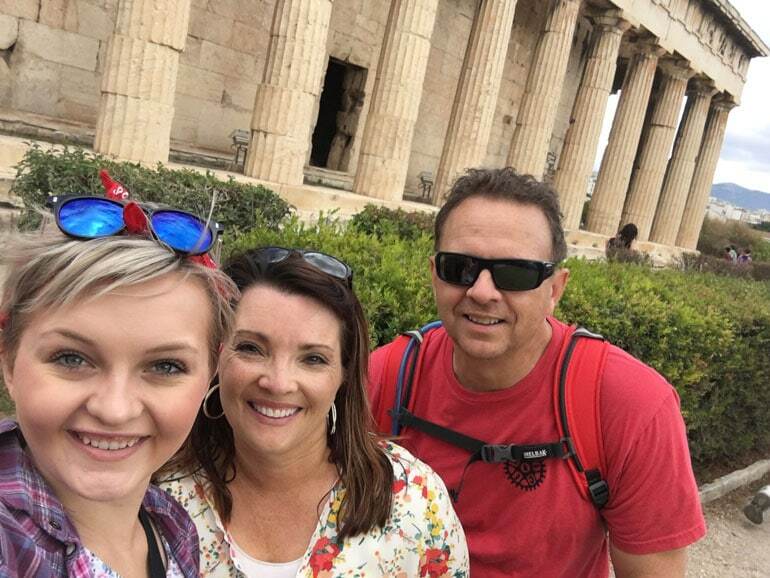 Just for fun, here’s a family selfie from our trip to Greece! It only takes 5 minutes and 3 ingredients to make this Greek yogurt lemon pudding, a simple everyday dessert with protein and calcium. Wash the lemon. 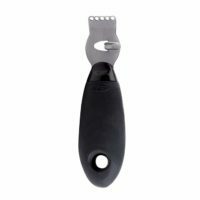 Remove the lemon zest with a microplane, zester or grater, and set aside. 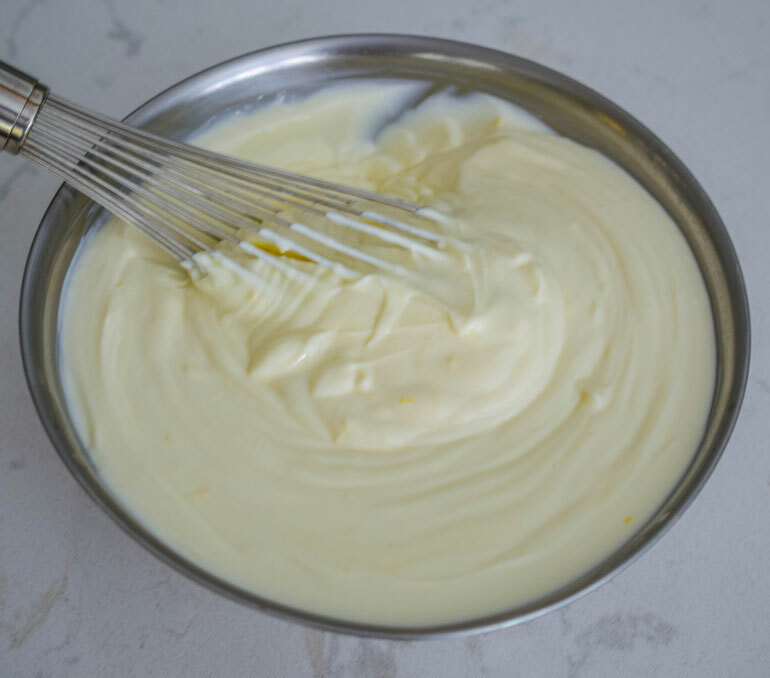 In a large mixing bowl, whisk together the lemon juice, lemon zest and sweetened condensed milk to combine thoroughly. 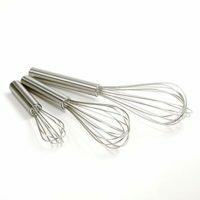 Add the yogurt and whisk to combine. You can eat the pudding right away, but if you have time, let it chill for at least half an hour in the refrigerator so the pudding thickens and the flavors blend together. 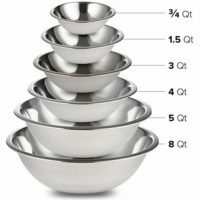 Spoon into individual serving dishes and top with fresh fruit, such as berries, kiwi, grapes or orange segments with the skin and pith removed. My friend and I took this class in September of 2018 and thoroughly enjoyed it. I have misplaced the recipes she sent home with us, so looked for the recipe for the Greek Yoghurt Lemon pudding online. So fortunate to have found yours as first choice. I could have made it from memory, but wanted to make sure of the size yoghurt to use. This pudding is pretty great and a something to make in a pinch. Thanks so much for posting this. I found the spinach pie made in the class to be so salty it was inedible – don’t know what went wrong, but I still recommend the class.